A noted publisher of Genre fiction, Pro Se Productions announces the latest volume released from its first author focused imprint. Reese Unlimited, the home of noted award winning author Barry Reese’s own personal Pulp universe, debuts the second collection of adventures of one of Reese’s most imaginative creations- The Adventures of Gravedigger Volume Two! "You will put them into their graves and shovel upon them the dirt that symbolizes their eviction from the mortal world." These words changed Charity Grace’s life…and death forever! Barry Reese, award winning author of The Peregrine and The Adventures of Lazarus Gray returns to the shadowy streets of Sovereign City with a new adventure featuring Charity Grace: Gravedigger! The Adventures of Gravedigger returns and Sovereign City's haunted heroine continues her mission of justice and vengeance, with the redemption of her soul at stake! In this volume, Gravedigger and her faithful agents confront the twin threats of Hiroshi Tamaki and the immortal beauty known as Pandora when they investigate the strange secret of the Silver Skull!" Returning to Sovereign City,” explains Reese, “always feels like coming home for me. I relished the chance to take Gravedigger and her allies in new directions and I'm thrilled for my loyal readers to experience the romances, dangers and excitement that make up this novel." 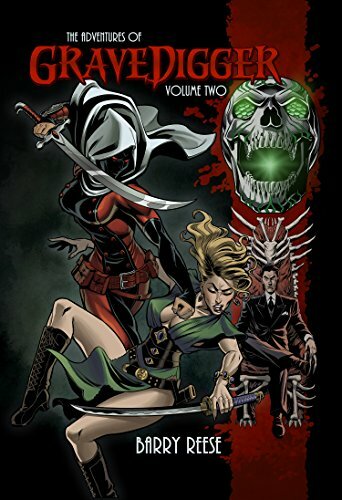 The Adventures of Gravedigger Volume Two features action packed cover art and logo design by award winning artist George Sellas, print formatting by Sean Ali, and eBook formatting by Russ Anderson. The latest volume from Reese Unlimited is available in print via Amazon at http://tinyurl.com/lj39tvm and at Pro Se’s own store at http://tinyurl.com/lkw6chqfor $15.00. The Adventures of Gravedigger Volume Two is also available as an eBook for the Kindle at http://tinyurl.com/kbmgkuf and for most other formats at http://tinyurl.com/opztpuffor only $2.99. DIGITAL BOXED SET FROM PRO SE PRODUCTIONS! BARRY REESE’S THE ADVENTURES OF LAZARUS GRAY: THE OMNIBUS EDITION DEBUTS!